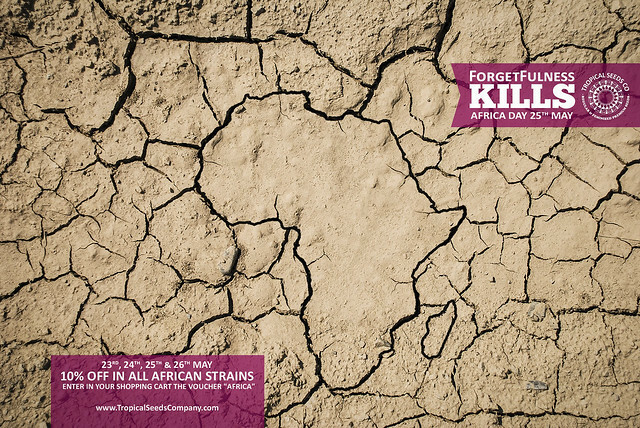 Help us to spread the flavor and the aroma of Africa, everyone has the opportunity to love this piece of the Earth. Tropical Seeds Company puts at your disposal all our african strains and hybrids of african strains and save 10% in commemoration of the Africa Day. During the days 23, 24, 25 and 26, enter the voucher “AFRICA” in your shopping cart. List of products on offer: AFROKUSH, BISHO PURPLE, CISKEI, COGNITION, DURBAKISTAN, DURBAN PUNCH, KING CONGO, OLD CONGO, RED AFRO, SWACKY, TOWERFUL & ZAMBIAN.